Happy Black Friday everyone!! After becoming an actual thing in the UK last year, you should more or less know all about Black Friday! Beginning today (27th November) this runs all the way through to Cyber Monday (30th November). Working in ecommerce myself for a number of sites it’s an incredibly busy weekend & there are some amazing deals out there to be had this year, including my favourite beauty site Lookfantastic! Last year Lookfantastic had some amazing offers on premium brands and they have out done themselves with their offering this year. 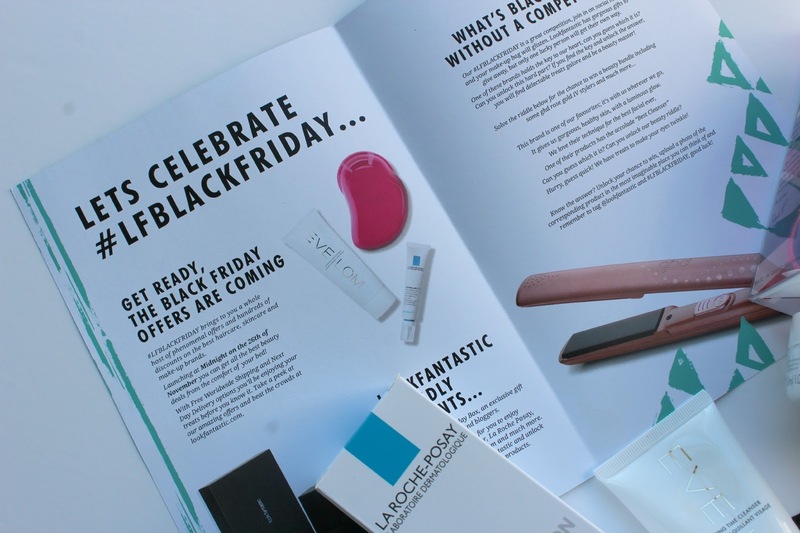 I’m sure you’re all desperate to find out which of your favourite beauty brands are on offer so you can find out all of Black Friday Deals HERE! 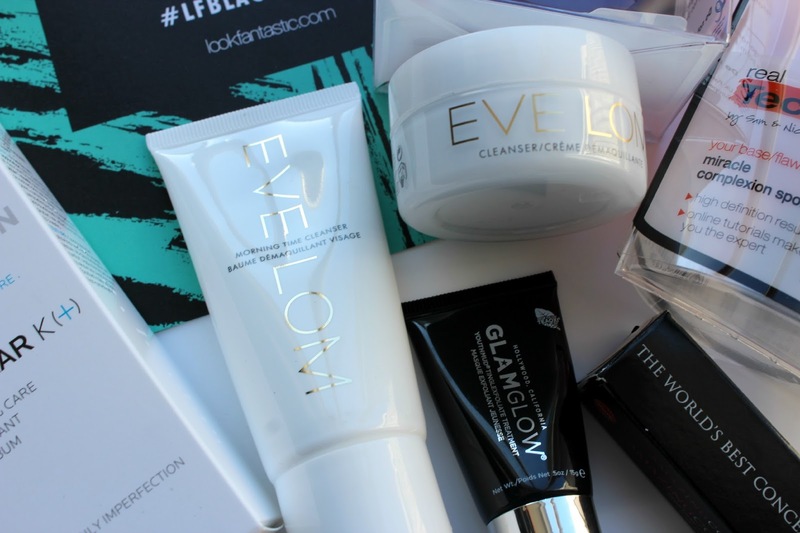 Lookfantastic also sent over the most lovely little box of goodies for Black Friday, very similar to their normal beauty box that they send out each month (which is amazing by the way) – and every brand included in this box is on offer this weekend including the likes of Tangle Teezer, Eve Lom, Glam Glow & more. If you’re looking for Christmas gift ideas or a payday treat, this little box of lovelies might give you some inspiration! Remember to #LFBLACKFRIDAY to get the low down on the offers this year & to let them know what you’ve been snapping up! 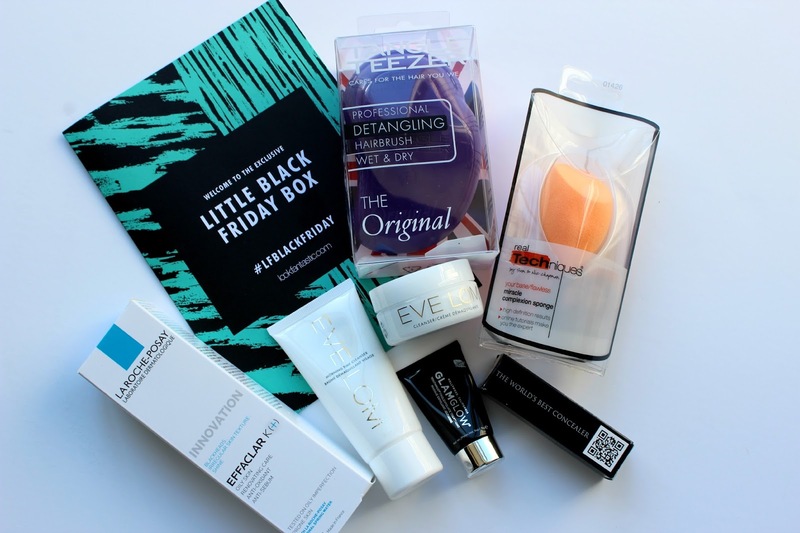 There’s literally nothing better than opening a beauty box and discovering the contents! 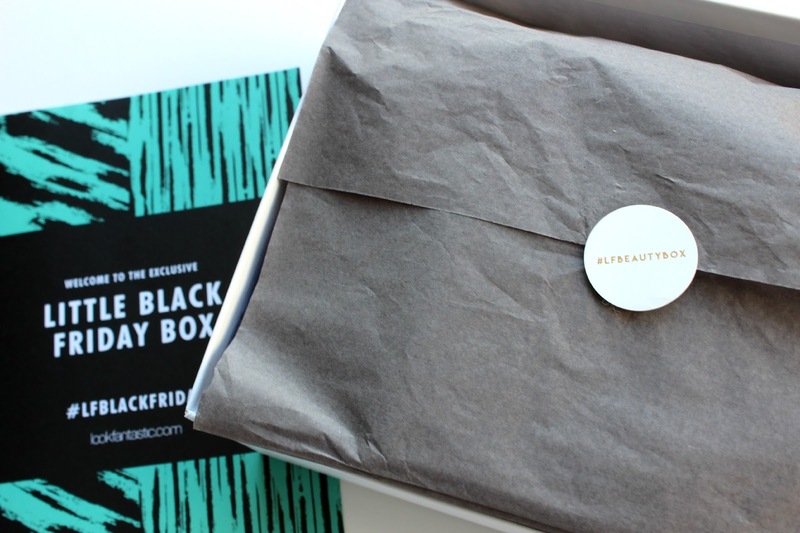 If you are interested in subscribing to their monthly beauty box you can find out more here. Packed full of 7 amazing products, it’s one of the best I have ever received – please note this box cannot be bought & it was an exclusive Little Black Friday Box*. I received glam glow in the first ever lookfantastic beauty box I had and I was so upset when it ran out. The cost of this face mask is 100% justifiable as it is just amazing, it’s the perfect mask for your skin when it’s just feeling a bit bleurgh, its a gentle exfoliator too and which helps to draw out all of the impurities in your skin. 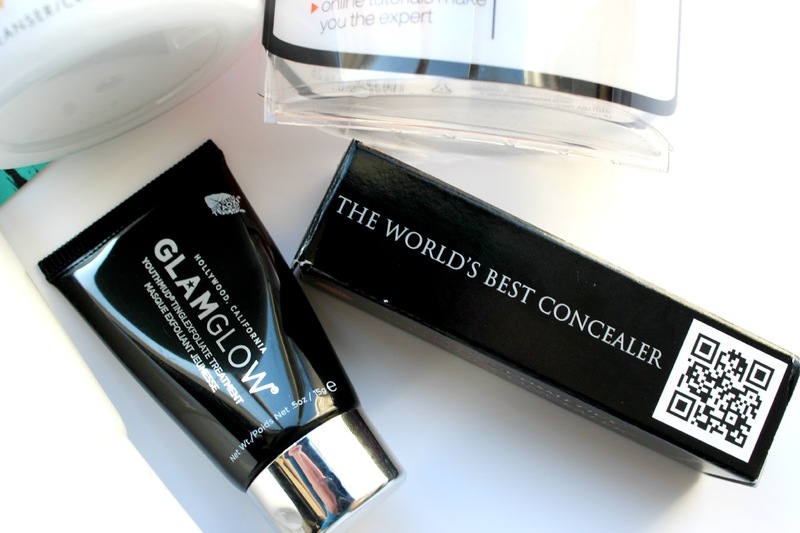 Glam Glow is definitely one to snap up this Black Friday as it is a very expensive brand! Something else to help combat the dullness in your skin is this amazing concealer from Amazing Cosmetics. I’ve not heard of the brand before but it is used and loved by make up artists, models and more, and it’s been dubbed as the “Best concealer in the world” – so it must be amazing right? Perfect for achieving flawless skin, this should be ideal for covering up my dark circles on those early mornings this winter. As it’s 3 for 2 across both ranges this weekend I think I’m going to have to stock up so I have perfect skin for the start of 2016! I’ve only started using makeup sponges recently and think the overall result is much more flawless than when using a brush or fingers. Unlike the one I currently have, this real techniques sponge is 3 in 1, so you can contour, blend large areas of your face and use the tip to cover up imperfections. If this sponge is anything like their brushes I’m sure it will be amazing, and with Black Friday they have a huge 35% off the core collection and 3 for 2 on everything else! 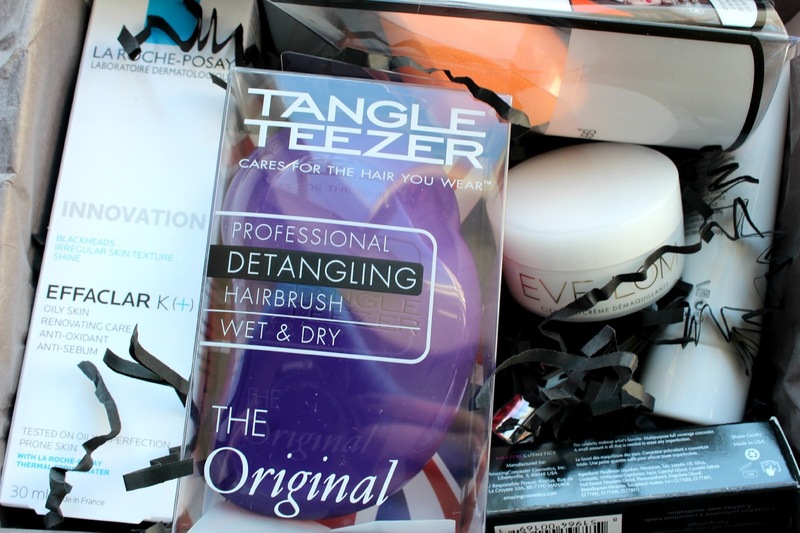 I have praised the tangle teezer in SO many hair blog posts now! They are the best brushes for all hair lengths, excellent for getting out nasty tangles, on dry hair or in the shower & without snagging your hairs, it’s the perfect size for popping in handbags and I now have one for each of my bags so i’ll never be without my trusty teezer. The colours are gorgeous too, I definitely have my eye on the limited edition twinkle tangle teezer! They have 3 for 2 across the whole range this weekend – perfect for stocking up on Christmas presents! Eve Lom is such a well known brand in the beauty industry, high quality products that are kind to skin and work miracles. I have had a lot of trouble with acne & spots in the past and I’m always looking to introduce new cleansers into my routine that will help remove my makeup without irritating my skin. These cleansers have been praised so much in the beauty world so I can’t wait to start using these too. Lastly in the box was a full size product from La Roche Posay. 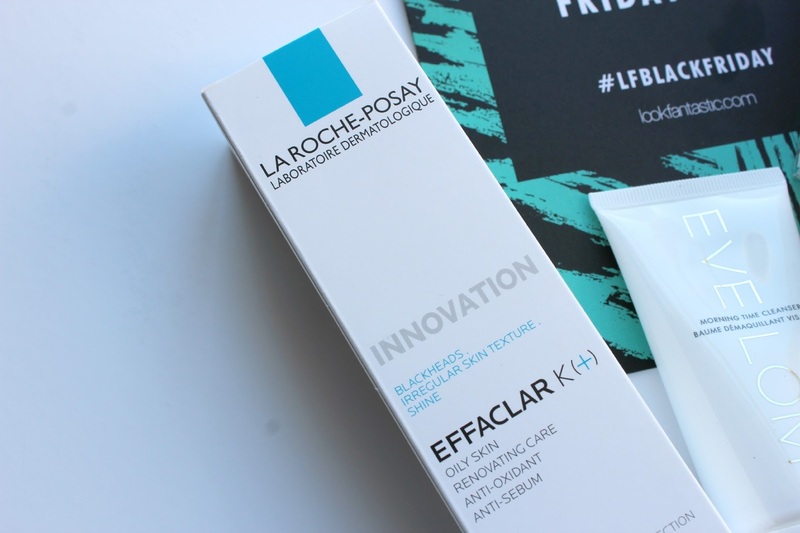 Similar to the effaclar duo that I have used before, the Effaclar K (+) is designed for those with oily skin and it works to reduce blackheads and mattifies the skin for up to 8 hours from the first use – definitely sounds like something I need! Having oily & combination skin is such a hassle to contend with, I wasn’t that keen on the effaclar duo but I’m definitely going to give this one a try and I will let you know how I get on! 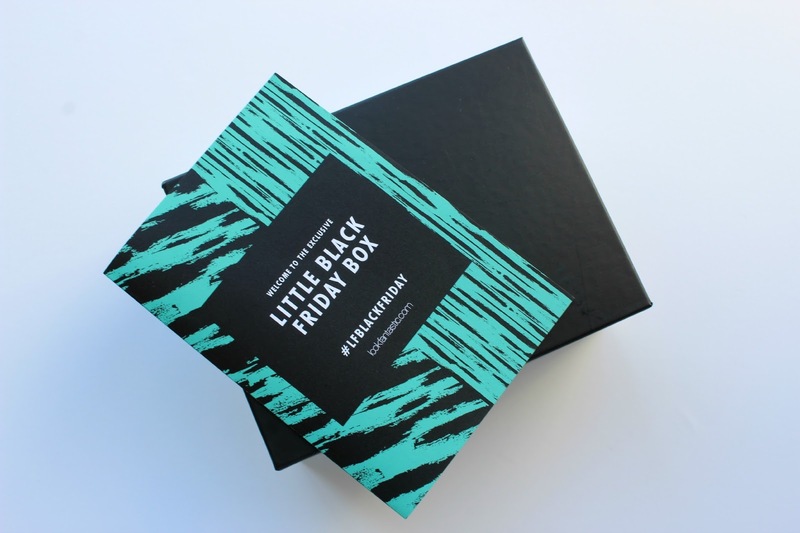 I absolutely loved my little black Friday beauty box and getting to try some of these products has given me an idea as to what to purchase during black Friday with the great deals that they have on offer – I will definitely be stocking up on Christmas presents as well as some beauty treats for myself, I’ve been rather good at treating myself recently instead of actually buying any Christmas presents though, always the way huh? As well as their amazing deals you can also get 20% off all orders with code: LFBLACK. Anyway, enjoy your Black Friday/Cyber Monday weekend and I hope you snap up some bargains, don’t forget to check out Look Fantastic’s amazing Black Friday deals which I have linked at the start of the post, & Do let me know if you pick anything up! Will you be taking advantage of the Black Friday deals this weekend? 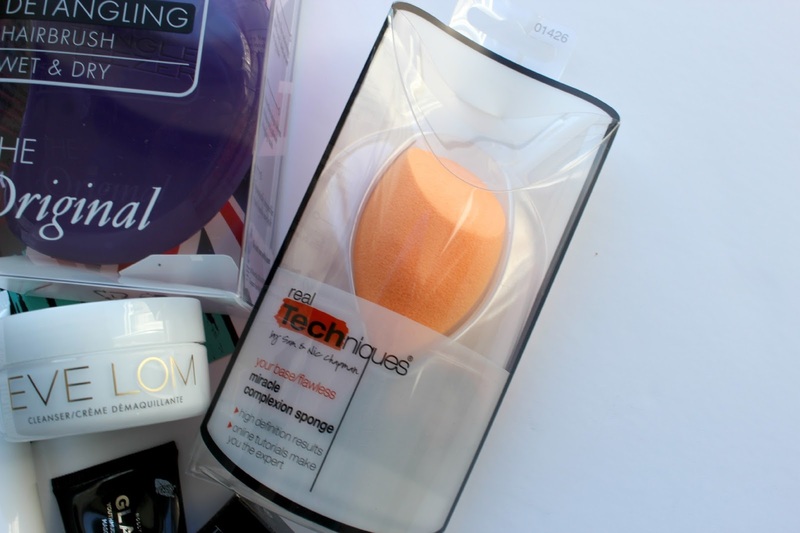 Have you used any of these products before?